There is no doubt that HMRC is increasing the number of compliance inspections it undertakes year on year. With the use of new technology, HMRC are looking for anomolies that may indicate non-compliance. With the significant impact this has on businesses and accountants, how can you ensure your tax inspection is as seamless as possible? In our latest eBook, we offer advice on how to streamline your own preparation for a tax inspection and how a paperless system can help with the process. 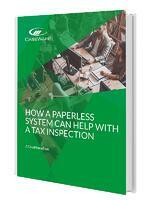 Download our FREE eBook to discover how you can benefit from using a paperless system for a tax inspection.